Hann drafting tables are handcrafted one at a time in the USA of North American hardwoods, which are known for their strength and durability. These drafting desks feature full frame construction, and their face frames are constructed using mortise and tenon joinery. Veneercore panels used for the ends and interior components are routed into the full frame and each other, resulting in sturdy furniture that will last for many years. Fiberesin tops provide a smooth, rock hard drawing surface. 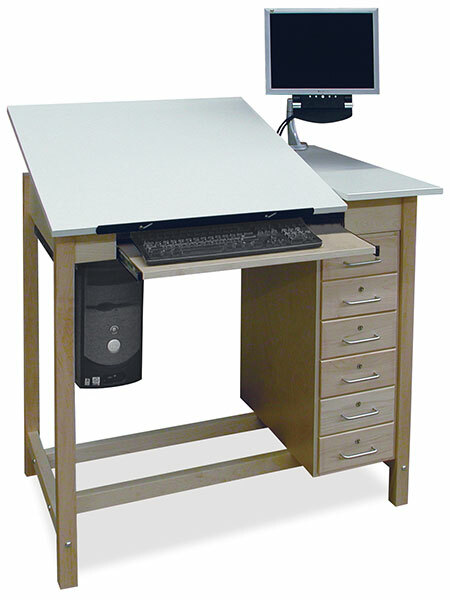 Adjustable Top CAD Drafting Table — This table is designed to incorporate traditional drafting with CAD and graphic design. It includes a pullout keyboard tray, a hanging steel CPU holder, a monitor arm, a wire management system, and a six-drawer storage unit. The adjustable 30"W × 30"D × ¾"H Fiberesin work surface is supported by a sturdy ratcheting mechanism. The right-hand reference top measures 12"W × 30"D. The desk measures 39"H × 42"W × 30"D at the front edge. It's made of solid hard maple and weighs 175 lb. Single Station Drafting Table — Constructed of sturdy northern hard maple with a natural finish, this drawing table has a tilting top measuring 33" wide × 32½" deep × ¾" thick. The reference top measures 15" wide × 32½" deep × ¾" thick. Six drawers provide lots of room for supplies, tools, and paper, and an inside ledge permits storage of boards measuring 20" × 26". Drawers are fitted with master keyed cylinder locks. The overall table size is 39¾"H × 48"W × 32½"D. Weighs 270 lb. 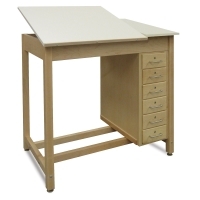 Adjustable Top Drawing Table — With a six-drawer storage unit, a pencil ledge, and ample room for working, this split-top table is great for drawing and drafting. Each lockable drawer in the storage cabinet measures 2½"H × 6¼"W × 19"D. The table's ¾" thick Fiberesin top is split with a 30" × 30" adjustable top on the left and a 12" × 30" fixed flat top on the right. Overall, the desk measures 39"H × 42"W × 30"D. It's made of solid hard maple.